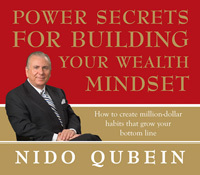 The desire for wealth often drives the business decisions and personal goals of business people. Most people shrink their dreams to match their income and then justify their position in life. Few expand their incomes to match their dreams. These immediate action steps will spark a shift in how you draft a wealth building plan. By following these often overlooked strategies, you can completely makeover your financial outlook while dramatically enhancing your high standards in life.